Now although there are no firm figures, security and political officials say hundreds of the well-disciplined Sunni fighters—many of whom have gained extensive knowledge about the American military—are re-joining the Iraqi insurgency. The defections of the Sunnis have been driven mainly by frustration with the Shiite-led government. In 2006, because they were being paid by the U.S. as part of the failed strategy of General David Petraeus, Sunni insurgents and tribal leaders began turning against the Iraqi insurgents. 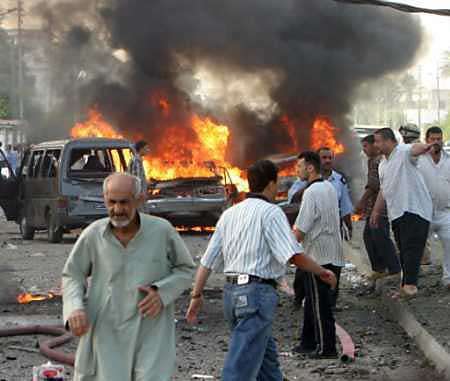 This caused a temporary scaling down of Iraq’s deadly sectarian warfare between Sunnis and Shias. The former Sunni insurgents that were being paid by the American military were also promised that they would eventually get jobs with the Iraqi government. Unfortunately, this was a false promise. There was no way the American military could fulfill this promise with its diminishing role in Iraq. General Petraeus’ strategy of paying the Sunnis to leave the insurgency was only a temporary fix—a tactic to make the situation appear better than it really was. Sunni leaders say that since the spring, as many as several thousand former Sunni fighters have quit, been fired, stopped showing up for duty, or ceased picking up paychecks from their government jobs. Recently, the atmosphere has become particularly charged as Sunnis find themselves being arrested by the Shiite government, accused of acts of continuing terrorism. The U.S. is trying to blame this on Al Qaeda, which is not the case—this is a return to the growing civil strife between Iraq’s Sunni and Shia populations. The U.S. must take the blame for the destabilization of Iraq. Much of the employment has been temporary and involved only menial labor. The government has hired only about 9,000 Sunni fighters for the security forces, with officials blaming budget constraints. Sunni leaders say they are not surprised about the defections given what they call the group’s marginalization by the government and its abandonment by the American military. United States forces had overseen the Sunni fighters in some areas of the country as recently as last year, including in Diyala Province, the violent area northeast of Baghdad. The United States relinquished control of the group as it began ceding more oversight of security to the Iraqi government. The American military has declined to comment on the defection of its former paid Sunni fighters to the insurgency—they blame it all on Al Qaeda—the American bogeyman. The Sunni/Shia conflict predates the U.S. invasion of Iraq by hundreds of years, with Sunnis gaining the upper hand. Now, that conflict is being renewed as Iraq slips into Civil War.